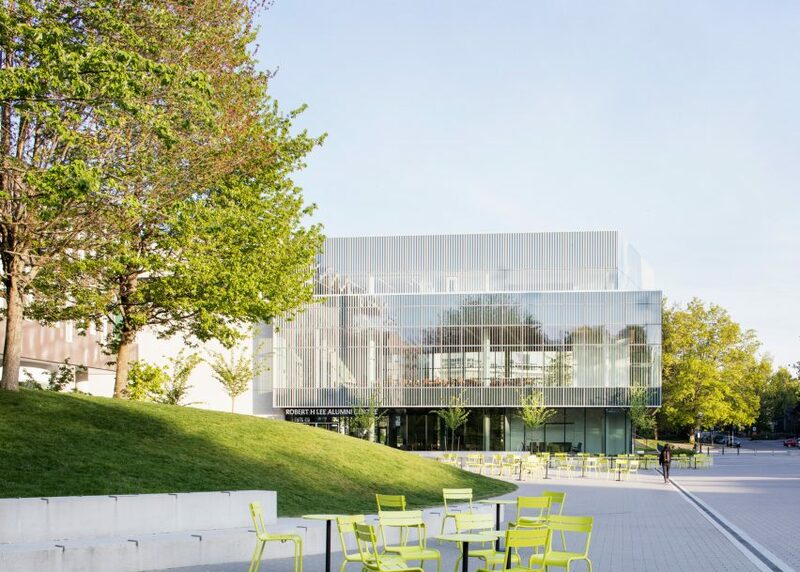 Canadian studios KPMB Architects and HCMA Architecture + Design have completed an alumni centre for the University of British Columbia with angled, fritted-glass facades that "change dramatically from day to night" (+ slideshow). 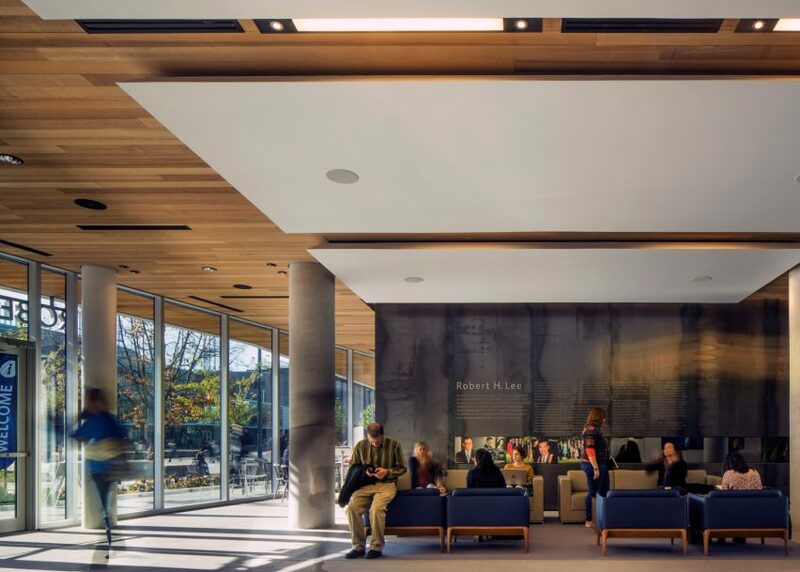 Rising three storeys, the Robert H Lee Alumni Centre serves as a gateway building for the University of British Columbia's campus on a coastal site in Vancouver. Established in 1908, the public university has over 60,000 students spread across two locations. 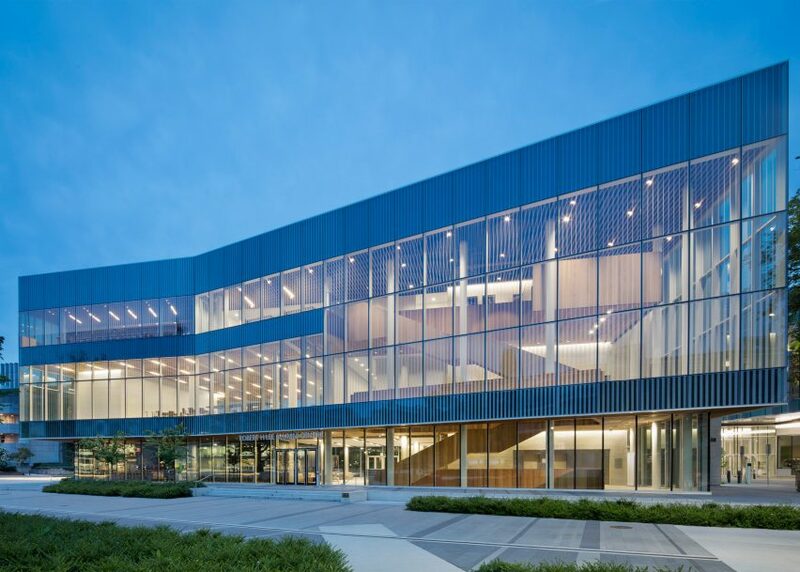 "The centre, along with the adjacent student union building, campus bookstore and bus drop-off area, create an important nexus of student and visitor activity," said KPMB, a Toronto-based firm established in 1987. "The centre provides a welcoming first stop on campus." 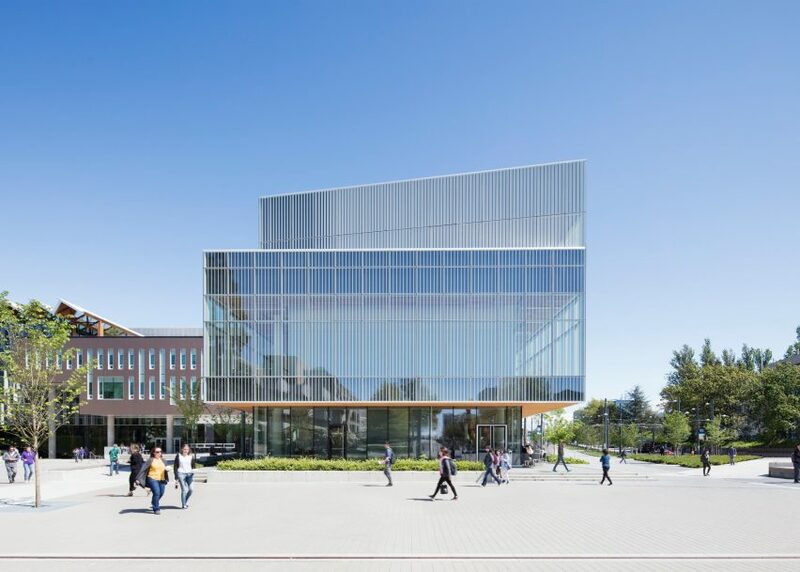 Encompassing 3,716 square metres, the building was designed to allude to its Pacific Northwest context and to the campus architecture, which largely consists of rectilinear buildings made of brick and stone. The scheme resulted from a collaborative process that engaged university stakeholders, along with representatives from the Musqueam First Nation, as the school is located on tribal land. "References to both the university and First Nation history have been carefully integrated into the architecture," said KPMB. The building is skinned with white-fritted glass of varying densities, resulting in facades that change in appearance. "The frit changes dramatically from day to night, grey skies to sunshine, giving the exterior a kinetic quality," the team said. A service block anchoring the north-east quadrant is clad in white concrete – a nod to the extensive use of white brick on campus. To add warmth to the interior, the team incorporated ample amounts of locally sourced wood. 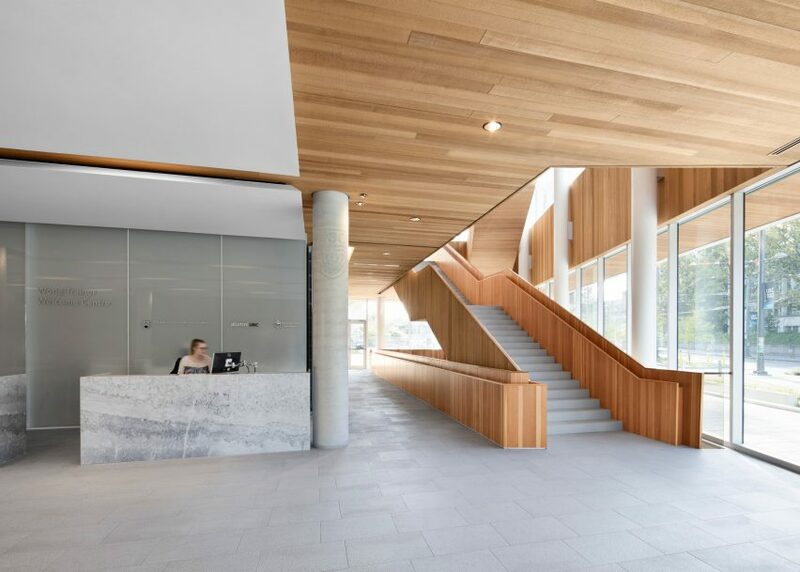 Rough-sawn cedar was used for ceilings and the outer casing of a main staircase that zig-zags up through the building. 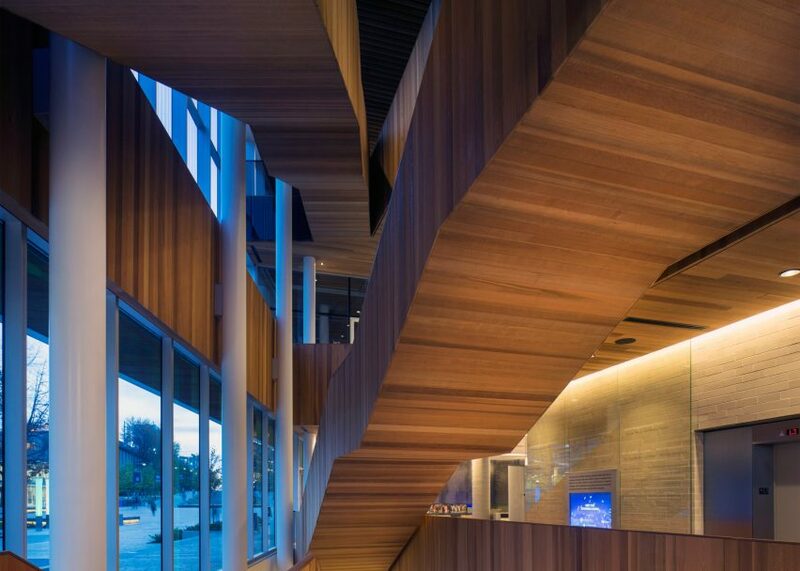 The interior surface of the stair is sheathed in Douglas fir, a wood known for its durability. The ground level – intended to be "highly transparent, porous and animated" – contains a cafe, fireplace lounge and library. 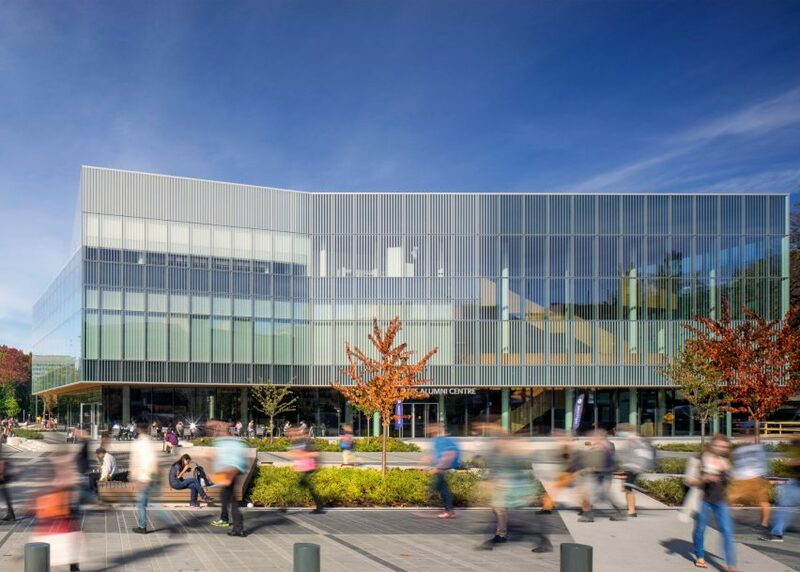 A hub for business startups, called e@ubc, is located below grade and is available for use by young alumni. The second floor houses meeting rooms and a grand hall offering 360-degree views. An additional meeting room for the Board of Governors is situated on the third floor and looks toward the heart of the campus. The top floor features a viewing platform. On the east end of the pavilion, visitors are provided views of one of the oldest elm trees on campus. 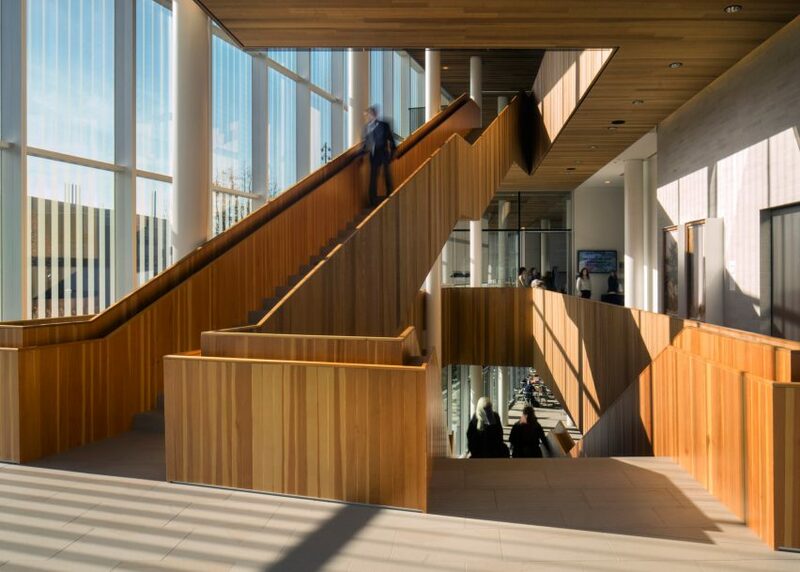 "As one ascends the stairs from level to level, the visual connection with this magnificent tree changes until one reaches the sky lounge, which is level with the top branches," the architects said. Designed to achieve Leadership in Energy and Environmental Design (LEED) Gold certification, the facility has a number of sustainable strategies, including optimised energy performance, recycled materials, water-efficient landscaping and two charging stations for electric cars. The building was constructed for 12.8 million Canadian dollars (£7.4 million), which KPMB described as a challenging budget. Other recently completed university buildings in the Americas include a medical centre at New York's Columbia University by Diller, Scofidio + Renfro and a sandstone-clad law school by Ennead in a revitalised portion of downtown Phoenix.